Today we’re launching a series of Smarter Rugby coaching videos here on Rugbydump that in conjunction with ASICS and Sir Ian McGeechan, will help you become a better rugby player, whatever level you’re at. As well as the videos, there are fantastic prizes up for grabs. McGeechan brings a huge depth of knowledge gained over years of experience, having coached the British & Irish Lions on incredible four occasions. • Excellence: to be the best you can. 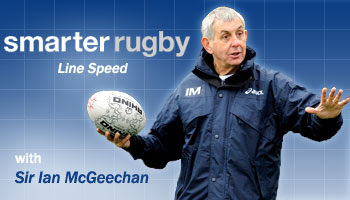 A total of 20 videos will be available through Rugbydump over the course of the next month, as well as great promotions to win signed items, kit and training sessions with McGeechan himself to be found on the ASICS website. Along with McGeechan, other ambassadors such as Joe Worsley, Euan Murray, and Stephen Ferris will be involved in taking you through rugby drills that focus on the basics right through to more advanced techniques. "Rugby is a game for all that combines simple elements to produce a beautiful game. The game needs intelligent players who are committed to excellence and I am delighted to be working with ASICS who embody these qualities. "I very much look forward to a long relationship where in our own small way we help contribute to the next generation of Smarter Rugby players," said McGeechan. In this first video, the focus is on line speed and methods employed to apply pressure on the attacking side. We’ll have another video coming up shortly. By learning how to become a Smarter Player and wearing the ASICS Smarter Boot, you can play Smarter Rugby with Sir Ian McGeechan. To enter the competitions visit www.asics.co.uk/rugby now. But they're all hitting with their inside shoulders, instead of going in with their outside shoulders in the tackle to push opposition to touch line. @ Anonymous - true, but if I got it right McGeechan was talking about 'blitz defense' in the end, where you're often using an ouside-in approach, rather than the more classical inside-out direction. Any other thoughts on that? pretty useless stuff there, more aimed at complete beginners. You'd be surprised, anonymous, at how poor guys can be at coming off the line quick - and, often more importantly, as a line instead of staggered. Guys who have been playing years, but still don't seem to get it. Good vid RD for a bit of variety. The basics should never be underestimated, the All Blacks consistently practice the basics and look how good they are! Consistently NO.1 or there about's. It'd be more realistic if the defenders lined up at least a meter deeper. Question. They are all looking at the ball (at the ruck or maul). Shouldn't they be looking at the player in front of them, except for the one closest to the ball who will shout when the ball comes out? I think this series is more targetted to coaches teaching younger players, like a highschool coach or something along those lines.